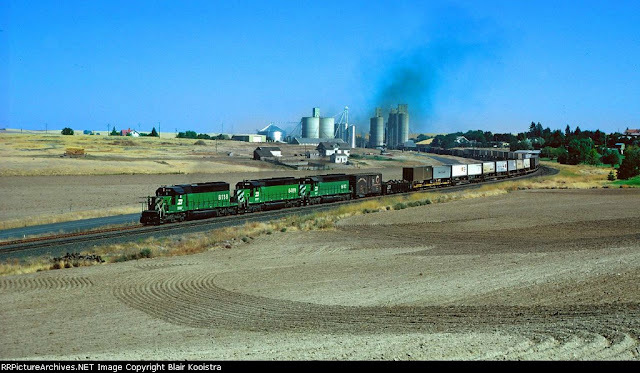 Blair says: "Westbound train #79 climbs through Harrington, Washington, behind a new SD40-2 and two SD45s on the former Great Northern mainline across eastern Washington. Approximately 25 miles of railroad from Bluestem to Lamona were doubletracked in the steam era to ease operating bottlenecks on the .8% ruling westbound grade. The railroad was operated under "current of traffic" rules, running right-handed. Train #79 was a priority manifest train that handled a big cut of piggyback traffic, back in the days before dedicated intermodal trains were coming." I believe there may be an error in the caption for the "BN Train at Harrington" photo. The train shown is leaving Harrington Westbound toward Lamona. I've lived in Harrington for 50 years and as far as I know, the uphill grade is Eastbound, toward Spokane. So the train pictured is heading downhill, not climbing. Checking the elevations online of Lamona (1797 feet), Harrington (2146 feet), and Bluestem (2336 feet) seems to indicate this. Also, the Eastbound locos (heading the opposite direction from the one in the photo) generally are working much harder than ones going Westbound. I'll stand behind what a local says any day. I've always thought the caption might be in error, but could not be sure.